Panasonic projectors help create world’s largest projected image at the Circle of Light festival. 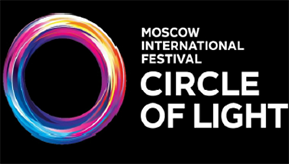 The Moscow International Festival 'Circle of Light' is an annual event which brings together light and graphic designers to produce multimedia and light installations using Moscow’s urban spaces as a canvas. 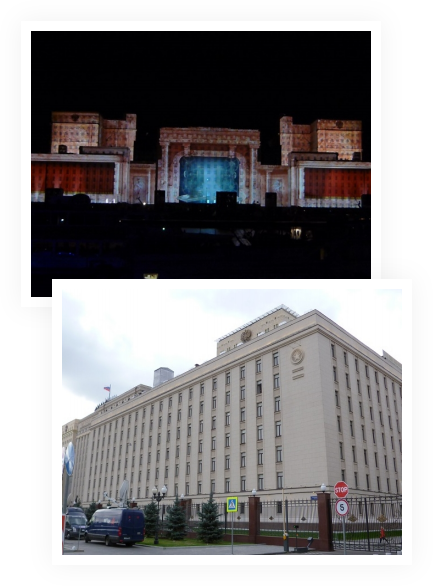 During the festival, projection mapping shows are projected on the facades of the most notable buildings, cultural monuments and other facilities in Moscow. Panasonic flagship projectors strongly supported the festival and on 4 October 2015, the final evening of the festival, the projectors were used to create the 19,099m2 'Light Discoveries' show, in the process becoming the largest projected image ever. This took place on a group of Ministry of Defence buildings, on Fruzenskaya Embankment in Moscow. 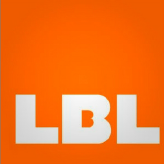 The installation was created for LBL Communications with the support of the government of Moscow, in celebration of the world's greatest scientists. CGI and live-action green screen was used to bring to life the inventors of electricity, cinema, radio, television, fibre-optic cable and the internet. The six video-mapping novels were created by artists from Russia, France, UAE and UK. 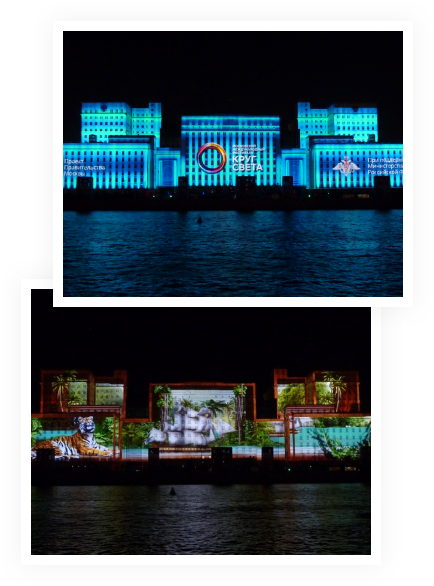 The projection was formed by 137 Panasonic PT-DZ21K2 Evo and PT-DZ21K series projectors, across eleven towers at the riverside and on the roofs of buildings. Hartmut Kulessa, European Projector Marketing Manager at Panasonic, said, "The DZ21K series has been used extensively across the rental and staging industry and this is a great example of the type of spectacular shows 3D mapping can help create. We are extremely proud that Panasonic supplied the hardware which took the Guinness World record for the largest projected image." The PT-DZ21K2 Evo series feature 20,000 lumens of brightness and a host of rich creative capabilities, whilst being packed into an extraordinarily compact body. The PT-DZ21K2 Evo is the updated version of the flagship PT-DZ21K projector. For this update, Panasonic redesigned the lamp modulation system, which has lowered the power consumption and extended the recommended lamp replacement from 2,000 hours to 3,000 hours. The new series is significantly more efficient, due to the use of reusable, long-life eco filters and lower-wattage lamps. A hermetic liquid cooling system has reduced noise levels from 49 dB to 46 dB, which represents a 50 per cent drop in perceived noise. the energy consumption has decreased by 10% and the image quality has improved with the newly developed picture enhancement system. The powerful new Real Motion Processor enables 120 frames per second. "With this projector only two installation crew members are required to handle it, it weighs 43kg, making it easy to stackinto towers. Each projector also has four lamps so, if one lamp fails, the show will go on."